#ChicSassyMomxUSA | Hello, San Francisco! Oh, hello there! It has been a while. It's good to be back. Oh well, I'm still active on IG as @chicsassymom and @noonades (🙊dedicated just for my fangirling soiree 😅), but my, my, as always, I'm such a busybody with so many Asian dramas (Meteor Garden and more) and real life dramas occupying my attention. I'm not sure but I will try my very best not to go MIA again, because blogging is such a good venue to channel all these pent-up dramatics. Hah. Anyhow, I super love San Francisco. I'm so happy to be here. Technically, it's a BART ride or an hour drive away from us. Let's just say, I'm happy to live in the Bay area where I can play tourist and host city tours to my heart's content. Plus, I do work in San Francisco, so that too. Here's just a post to break the ice. 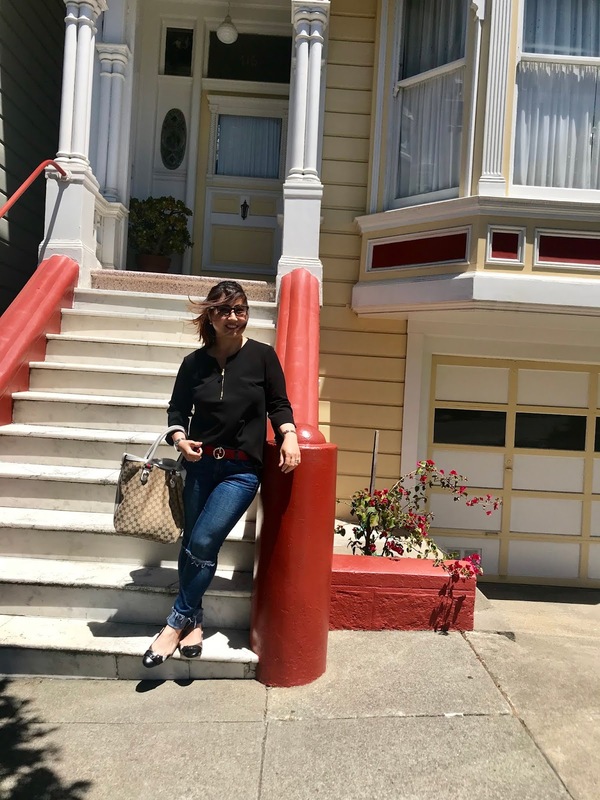 When in San Francisco, Pier 39 and the Painted Ladies are must-see. San Francisco is a host to stunning array of Victorian and Edwardian homes. This is one of the row of beautifully, ornate homes near Limon Rotisserie, South Van Ness. I can't get enough of the city, there's still so much more to see. So when we had the chance, we came to see the Painted Ladies. We're coming from a family gathering in Limon Rotisserie, and we're pleasantly surprised that just near it, where we parked, are even nicer and enchanting Victorian homes (photo above). Hello, #PaintedLadies ! 🏠🏡🏘These are the iconic "Painted Ladies" along Steiner Street. They are one of the best-known row of Victorian Houses across the Alamo Square Park. Having said that we're sort of locals now, it's now our pleasure to tour visitors around. Our favorite lunch venue in the city is the Pier 39. There so much to see (there is one San Francisco heart here) and to do. From our different visits, the feel and vibe beautifully change with the season. I normally love Fall and Winter, but my, spring is such a delight to see with the many different flowers blooming. Aha. The many seal lions I've been used to seeing were apparently not present all year round. They go missing for several weeks until they go back home to the famed Pier 39 dock. Now, I know.